Henri Cartier-Bresson snapped his images inside what he called The Decisive Moment, operating on instinct, capturing the essence of life. That is all I know. 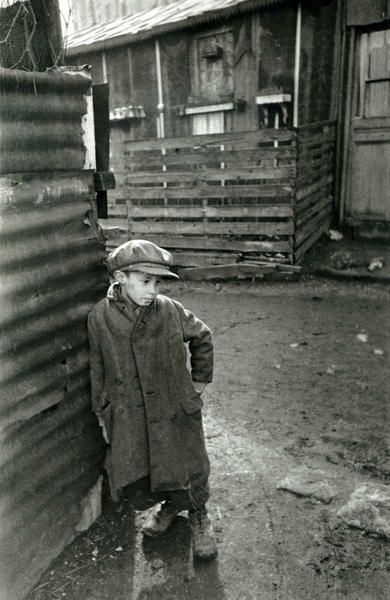 The boy was the poorest of the poor in Paris between wars. He stopped and his feet slid inside worn shoes, which sank with an ooze in the mud. Underneath a grimace of gray sky, he leaned against the tin wall of the hovel he called home and listened to the chaos within. Scraping, clawing, scuffling. Yelling, screaming, crying. Bumping, knocking, thumping. The last vestige of hope drained from his body; soon his father would come for him. The cold metal clawed his shoulder through an overcoat that weighed down his frame. Panic spread from his stomach in escalating surges, poisonous petals growing with each pulsating push to grip and twist his bowels. His lungs were afraid to admit air. He sought escape from the maelstrom with every vibrating atom of his being. He waited. And waited. He reached out his empty little soul. His face took on a concentrated intensity. His eyes focused, unfocused. His chest slowed its rhythms, his mouth fell slack. His hearing slowly muffled, the violence became silence. The cold metal released his shoulder, and gloom gave up its quest to permeate. His dirt-caked body felt clean—and then he left it behind. In this moment, though he did not know it, the boy instinctively practiced the ancient art of Transcendental Meditation. Sunlight crept along the filthy slum, glinted on the window’s jagged glass, and turned the mud a tawny tan. It moved as if seeking him. It snuck over the folds of the boy’s soiled cap and rippled down his arm. Wave upon wave of warm, liquid love infused the center of his chest and rolled through his veins. The sunlight was gentle, like a hand blessing him.